* Traditional potato growing to feed the family. Planting potatoes in your garden is no effort at all when you consider the likely rewards - a magnificent crop growing right outside your door over the coming months. Bright sun, cool nights, frost free, moisture-holding or watered earth but well-drained. U.S.A. Potato Planting Season: (zones 8-10) Florida, Texas, California: plant Fall time for the earlierst spuds, then Spring to late Summer; || N.Carolina, plant March (for June/July); || Oregon, Washington, Idaho, central states, plus Maine & Vermont: plant 2-3 weeks before last frost in March-May. U.K. Potato Season chit earlies from Dec, planting potatoes spring to late summer - plant a late crop with short season varieties. You can extend short potato seasons by using potato grow bags and planters - find out here. Potato plants are heavy feeders so a good dose of well-rotted manure is called for. A month to 6 weeks before planting potatoes, fork about a 3-4"/10cm depth of manure into the top 6"/20cm along your intended potato rows. Alternatively but rather in addition and before planting, sprinkle a band of solid organic fertilizer like those on this link. Don't overdo nitrogen fertilizer as this makes excess leafy tops. Nutrients improve the growing potatoes from day 1 and working them in early gives the organic fertilizer time to become available to plant roots. When fresh comfrey leaves become available later, you can add them as a mulch to provide nitrogen and especially potassium to your maincrops. Regular feeding is continued as potato flowers appear. Your dormant seed potatoes need to be 'woken up'. With 'earlies' and 'second earlies' this is done by chitting or sprouting the tubers before planting potatoes - see below. Your chitted potato tubers will have strong actively growing shoots. So when they go out in the cool, their leaves and roots are already well on the way to a good crop. And with 'Early' and 'Second Early' potatoes chitting has been found to have a positive influence on potato yeilds. The shorter spring day length may stimulate your 'early' potatoes to form tubers. Once the message is sent it is remembered. And you might be able to hold sprouted earlies cold and dry for planting in August. 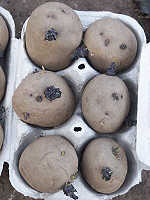 Alternatively buy specially prepared seed potato when planting potatoes for late harvests. Remember that potato tubers bought for eating may have been exposed to sprouting inhibitors. Choose your favourite variety here for home grown. Chitting 'earlies' should start 6 weeks before planting potatoes - mine have been overtaken by 'second earlies' and you can give them a short spur in warmer conditions if they're slow to chit. but just one stalk end. A little longer than a thumb nail - a fat potato shoot is ready for planting at about 1 inch long. You don't need to chit maincrop potatoes before planting as the ground is warmer at that time and, no advantage has been demonstrated. 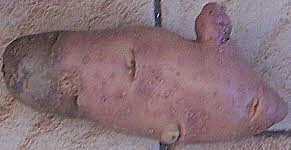 The shoots known as 'potato eyes' are concentrated at one end of the potato tuber known as the 'rose end'. Notice that the opposite end has the scar where the stalk attached it to the mother plant. 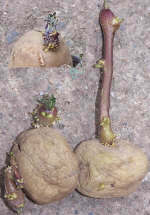 Fingerling potatoes like 'Pink Fur Apple' shown above have the eyes spread out more evenly and could be planted on their sides - the stalk is at the pointed end here. Chitting potatoes simply involves leaving the tubers in a light room - e.g. a window sill or conservatory - at a temperature above 4oC / 39oF but not too warm (below 10oC). Set the tubers in the box 'rose end' up - add name labels if necessary. Egg cartons or empty seed trays are ideal for boxes. Then place the box in a light frost free place. Your potato tubers will start to shoot out. Organic gardeners also water on liquid seaweed before planting as it grows healthy plants. Liquid seaweed strengthens the shoots and provides essential nutrients for healthy growth. You should regularly drench the foliage with it. Try this link for seaweed meal ( Kelp Meal America) . You want about 3 strong shoots per tuber. The more shoots left on the smaller your potatoes will be and vice versa. 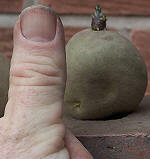 Most gardeners advise rubbing out the unwanted shoots with finger and thumb. And my experience shows that cutting the unwanted shoots with a potato peeler, as one grower recommended, may lead to rotting. 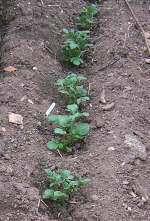 The potatoes are ready for planting when the shoots are strong and thick and about 1 inch long. You can cut potato tubers into pieces that contain a few growing buds. This practice is probably best restricted to growing maincrop and it may produce less. Leave any cut surfaces for a few days to heal or callus before planting. Potatoes can go into garden soil about 2-3 weeks before the last frost. That's about how long it takes the shoots to come up. They can go in earlier if you protect them with fleece, or a tunnel cloche. Planting potatoes of maincrops outside should probably be done by the end of April. After this time the longer days will delay the onset of tubers. By late July and with the days shortening again you can do more potato planting. The varieties chosen for a Christmas harvest are specially prepared 'earlies' - you can get them from this link. Tubers can be different sizes which effects planting depth. I suggest planting potatoes so the soil covers the top of the 1 inch long potato shoot by 1 inch - no less. A 2" long tuber needs a 4" deep hole. In drier conditions plant a little deeper. For 'Maincrops' plant 45cm (18") apart in rows 75cm (30") apart. 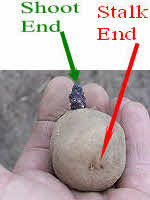 A string line or straight edge with distances marked off is useful. The soil scoop is ideal for making planting holes. Reducing space between rows will reduce the size of your potatoes. Better to increase the between-row space and plant a row of smaller crops such as broad beans in between. Potato rows should ideally be orientated north to south. That way ridges warm up evenly on both sides - and the longest shadows fall into the wider space between rows. Bigger potatoes for baking may be obtained by warming the soil evenly like this. With deep well-drained and cultivated soil I often take out a furrow piling soil into ridges on both sides of the row. The tubers go on the bottom of the furrow, sometimes I plant them in a hole too. Soil is drawn over the potatoes to cover. Then by moving soil across I will turn a furrow into an earthed up ridge. It's good to have the potatoes well earthed up. You may get a bigger crop as the potato tubers are covered, moist and well protected. The potato stems are supported. A draw hoe is the ideal tool for earthing up. TIP: You should mulch (i.e. cover) potatoes with lawn trimmings. Potato plants can be grown in well-rotted garden compost trenches assuming they're not saturated. Avoid raw unfinished compost which risks an attack by soil pests like millipedes or slugs. Otherwise you stand to gain a good potato crop this way. 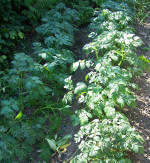 Some gardeners report that planting potatoes on the compost or manure heap is also a success. The Potato Council - growing news, potato industry updates & reference pages.